The HYDAC Portable Contamination Analysis Kit is a vital tool in condition monitoring. It helps you identify and monitor the types and levels of contamination in fluid power systems. Indeed, this kit enables instant visual analysis. To this goal, it uses an optical microscope of major types of system wear including bright and black fibres, metals, silica, plastics, elastomers and more. First, we pass a sample of the test fluid through a filter membrane via the vacuum pump. The sample is then dried and mounted in a membrane holder ready for visual assessment. What’s more, we supply a comparator booklet with the kit to help establish and identify cleanliness levels of fluid samples. 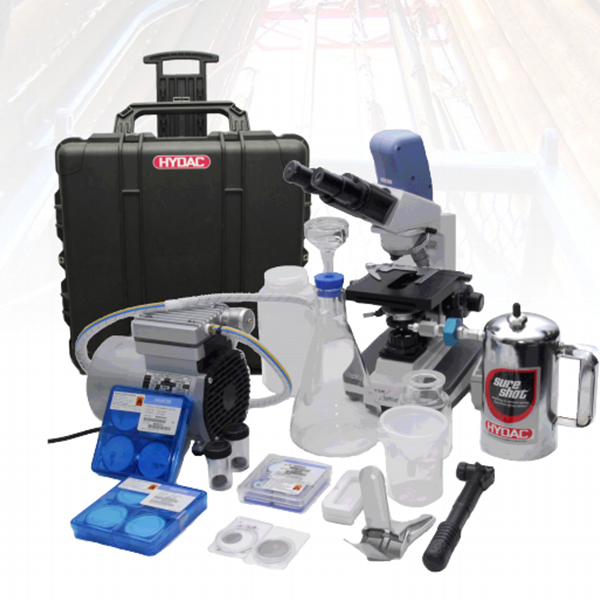 Therefore, we supply a complete kit, with all the necessary requirements for taking instant samples. It is also simple to assemble and use. Please, note that a full training on how to use the kit is also available on request.